We are a year round indoor training facility. Depending on your mountain goals we can work one on one or with a group. 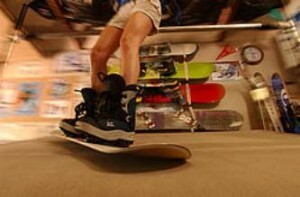 We offer lessons exclusively on Snow Biste or in combination with a fitness program. We then transition your skills to the mountain with experienced instruction that builds on your indoor experience. 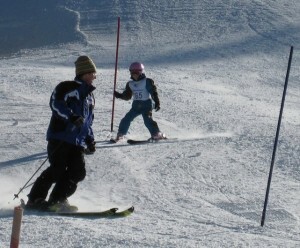 We sell multi session and season passes for Snow Biste training. Our facility is easy to get to located within Sierra Strength & Speed located off of Longley near the Fitness Connection. Every new client goes through a one hour Foundation session. We want to make sure you have a firm foundation to build upon, whether you’re new to the sport or a seasoned veteran. We teach and communicate utilizing terminology that is standard in the industry. We build upon your previous sport and exercise experience to grow your knowledge in mountain sports. 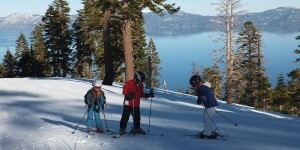 Then we get you on the ski deck to begin your familiarization of the surface and start teaching our curriculum. By the end of this foundational session you will know how to move forward, stop, and have a basic understanding of terminology as well as basic success techniques for your first day on the mountain. Learning skills that take many people a lifetime just isn’t possible for busy people that balance a family and career. Our standard skills proposition is called the Success Package. It includes a one hour Foundation session plus four half hour private lessons enabling you to conquer the slopes faster than ever before. For those ready to get on the slopes as quick as possible we offer a basic winter success package that includes one Foundational session (prior to going up to the mountain) followed by one half hour session to be taken within the first two days of skiing. Our one on one teaching method has the coach supporting and teaching while standing in front of you as you ski on the Snow Biste. Being in front of you we can control your learning speed with instantaneous feedback while avoiding bad habits. To learn more click here. Some people perform better within a group environment. Having your friends or family to push and cheer you on gets some athletes moving faster and with more confidence. We can work with groups of two to eight. Groups of 3 or more include a fitness training circuit that provides balance, endurance and strength training. The Snow Biste deck can safely hold more than one skier . Learn more about Individual Training. Mountain lessons for skiers of all ages. Once you have proficiently passed the Green Level of our curriculum sign up for an On-Mountain transition. The program includes a transitional session that takes the knowledge from your indoor training sessions and brings you out to the mountain for the first time. We know a great deal about your ability and can get you on the slopes faster than anyone else. We want you to be successful, graduate and become a regular at our Tahoe ski resorts. Even though the Snow Biste ski deck is a good year round training environment, some skills need to be learned on the mountain. Those skills include mogul skiing (bumps), powder, terrain parks, weather and varied terrain are a few. This fun day of skiing on the hill can include up to 2 of your friends. To learn more call us directly or click here about Mountain Lessons. Not every session need be on the deck. Kris has developed fifteen exercises that help build a skier’s ski muscles, strengthens the body overall, and builds endurance. To learn more about Group Fitness. The Snow Biste was designed to be portable. This most unique of services brings new life and excitement to your private or corporate event. Give your employees the chance to learn to ski in a safe environment. The Snow Biste moves at pace slow enough for children to enjoy and fast enough to keep adults and experience athletes having major fun factor. To learn more Corporate/Private Events.